What was God's purpose in creating man? Man, created a religious being, is dependent on faith. He has a mind and reasoning abilities, just as he has lungs and the power of respiration. But reason does not characterize man's nature any more than does breath. 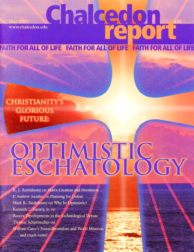 Eschatology is so often abused today that it has become a source of positive embarrassment to the integrity of the Christian Faith and Biblical Christianity. The judgment-scene Christ presents in Matthew 25:31-46 best fits a postmillennial view of eschatology. I mean this in two senses, with especial emphasis upon the second sense that will be explained below. In the midst of what many call a "post-modern" crisis in which we're told that there is no objective truth and everyone is free to make up his own "reality," the goodness, grace, mercy, and power of God and His eternal law become ever more conspicuous and irrefutable.